Net zero energy is possible, even in Seattle. 575 solar panels generate more energy than the building uses in a year. One meter measures energy sold to electric utility, one measures energy purchased. 230,000 kilowatt hours per year is the expected total energy generation by on-site photovoltaic array. To be certified as a Living Building, the Bullitt Center must annually produce as much electricity as it uses. To achieve this goal, the Bullitt Center has 575 solar panels on the roof, creating a 14,000 square-foot array to generate electricity. The panels are sensitive to the amount of daylight they receive, meaning that production values are closely related to solar intensity and sky conditions. In the summer, the Bullitt Center will produce vastly more electricity than it uses, and in the winter it will produce less. Normally panels are set to face south, at the angle of the latitude so that they can collect sun in the winter. However, the designers realized that in Seattle, most of the sun is received in the summer, and the shallow-angled winter sun would not provide much benefit behind the blanket of clouds that shrouds our fair city during winter. The decision was made to optimize for summer, using the electrical grid as a battery to store power in the summer, and draw power from in the winter. The Bullitt Center energy budget shows how the summer surplus can offset a winter deficit. In order to “store” the summer’s surplus, the Bullitt Center uses Seattle’s electrical grid, pushing electricity onto the grid in the summer months when production is high (and when Seattle’s demand is at its highest). The building then takes electricity from the grid in the winter months when production is low. To achieve its “net zero energy” goal, the summer production surplus must meet or exceed the winter production deficit. Two electricity meters live in the core of the Bullitt Center, carefully monitored by Seattle City Light and the Bullitt Center building engineer. One spins clockwise for the amount of energy the Bullitt Center is pulling from the grid, the other spins counter-clockwise and counts how much energy the Bullitt Center is pushing back onto the grid. The second part of the net-zero energy equation is the energy consumption of the building. A typical office building operates at 92 EUI (Energy Use Intensity, which is comparable to miles per gallon in a car). 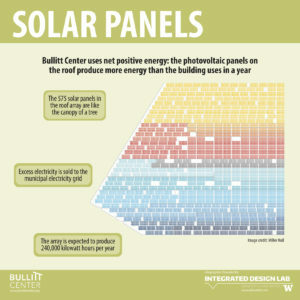 If the Bullitt Center had an EUI of 92, it would have needed an 82,000 square-foot solar array on the roof to generate all of its energy from the sun. Instead, with the integration of energy saving systems, such as passive ventilation, ground source heat pump, and natural daylighting, along with the help of tenant energy budgets, the Bullitt Center will be able to operate at an EUI of 16. With such a small EUI, the 14,000 square foot rooftop array is able to provide for all the electrical needs of the building.